Doodle Pantry has a secondary release this month of some older sets, now available in a colorized version, and a set of fabulous digital papers, called Country Flavors! 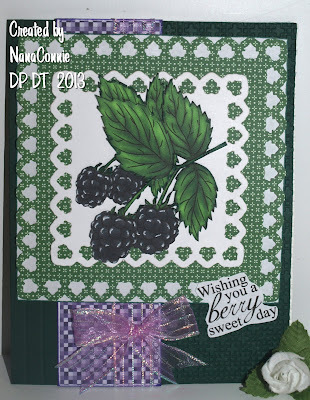 Oh, I'm in love with nearly every one of the papers, and since blackberries are probably my favorite summer fruit, I had to do a card using blackberries for my image and two of the new papers. This just brings back great memories of heading out into the wild with buckets in hand and then picking wild blackberries until we had pounds and pounds of them for eating, freezing, baking pies, and finally making jams and preserves. Mmmmm, definitely the best of summer! Here's my card using the "Blackberries" set. That set has its own papers, but I chose to use papers from the new Country Flavors set. and my colors from the challenge at Inkspirational. The image is printed twice in different sizes, then fussy cut and layered together. The same thing could be done merging .png images together but I'm still working on how to do merging so fussy cutting is my best option at this point. The images are layered onto a die cut which is mounted onto another larger die cut, made with one of the Country Flavors digi dp. That one is backed with white paper. I used a second County Flavors dp for the vertical strip and added sheer purple ribbon with a great sparkle in it, then tied a bow. The sentiment is also from the Blackberries set and it's just printed and cut free hand, with scissors. It may be hard to see but I hand embossed two lines down the left side of the card, and then used the "Lattice" embossing folder on the right side of the card front. Obviously, those embossings were done before I started layering everything onto the card. 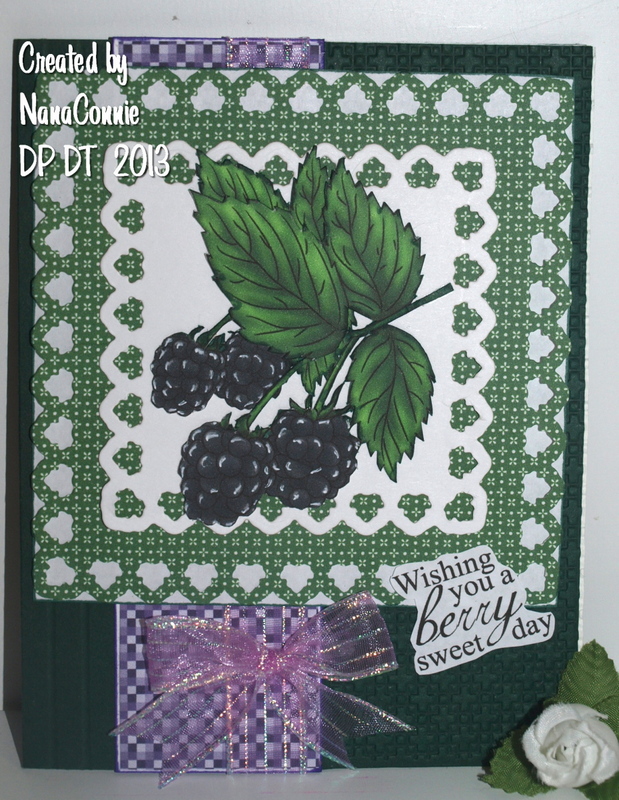 Check below for a photo of the new Blackberries colorized set, and be sure to check out the Doodle Pantry store to see all of the new releases. Don't forget our challenge. If you enter by July 24 (must use a DP image), you'll get a free set and you can get another free set with any purchase made by July 24. There's also a new freebie set called "Viola Ants" on the Freebies page at the store. How can you lose? So yummy, beautifully colored and love the design. Absolutely gorgeous and a wonderful take on the colour inspiration. So love the colouring. Wow... so many details in this card! I like all of your layering and your use of the colors is great. I also like the almost hidden ribbon/bow detail. I am so glad you joined us at Inkspirational! I love blackberries too - actually, I enjoy the process of gathering them from the hedgerows, taking them home and cooking them in a crumble. Your lovely card reminds me of all this and is perfect for our colour challenge. ooooooooh yummy Connie, I love blackberries and these look good enough to pick of your card and eat. Another gorgeous card. I too love these papers! They will be super for when I need that special color. Your card and paper choices are perfect. Now I want some blackberry cobbler. Fun fun card and love the blackberries paired with the new papers. Great job. I love blackberries too. I like the design you cut your mats into. reminds of a basket that strawberries/blackberries would come in. Hope to see you back for CiSC #3 which will be posted on July 19th. Perfect summery card Connie and a great job with our colours and fab texture! Yum, I'm wanting to eat blackberry and apple crumble with vanilla ice cream now! Gorgeous, those papers are awesome with the blackberries! Fabulous card! A wonderful creation as always NanaC! I love the image & the colours are fantastic! Aren't the new papers just fabulous! I know I will be using them a lot! Your blackberries look good enough to eat! Hmmmm cobbler? Thanks for joking us at Inkspirational! Love this card, it really says Summer's here! We have blackberries growing our backyard but with so much rain they just won't ripen! Beautiful Connie. Great image and that bow is just as yummy as the berries. Love the textured folder you used! It just adds a pop to your creation! Fabulous inspiration! Thank you so much for sharing it with us at 4 Crafty Chicks. ohhhh what a yummy card! I really love the great die cuts you have used. Oooh NanaConnie I love the deep rich colours, my favourite kind! Beautiful card. 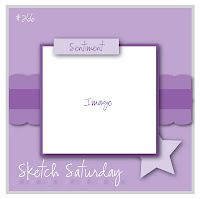 Thanks for joining us at Sketch Saturday this week and good luck! Your creation is so beautiful with it's yummy reminders of summer and the rewards that good berry picking will bring. It reminds me of the days when I would berry pick with my Dad, and would pop some of those juicy morsels in my mouth instead of in the bucket. Lol. Thanks for the memory. Thanks for playing along with us at Clearly iStamp Blog Challenge. NanaConnie, you did an awesome job on this card. I love the double image. This card reminds me of when I was a little girl and I used to hang over the fence and eat the blackberries off my neighbor's bush...ahhh, what memories!